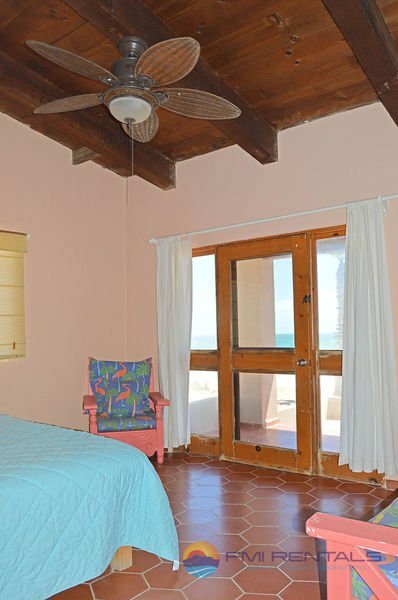 Casa Chapman is beachfront property at its finest. 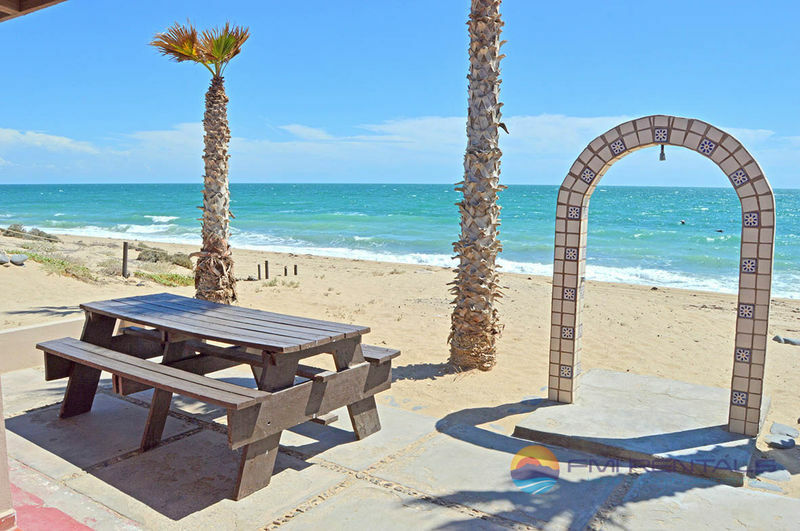 Let’s just say this Rocky Point vacation home will be in high demand. 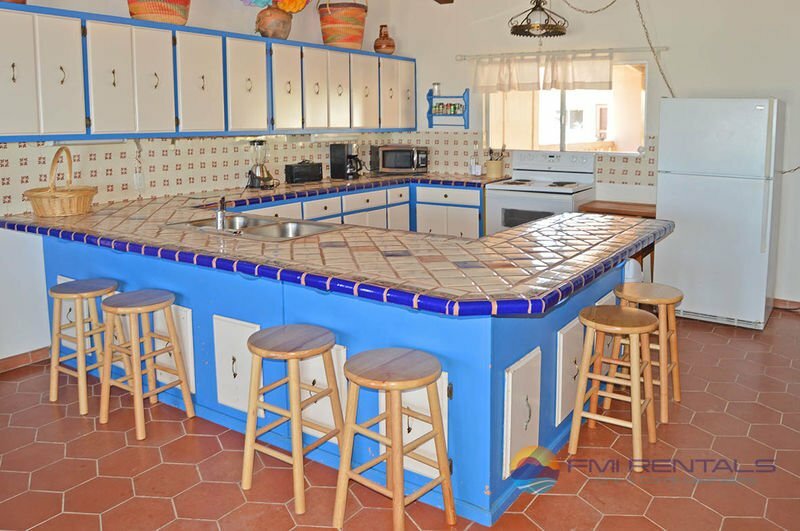 This house has 3 bedrooms and 2 baths, capable of supporting 8 people comfortably. 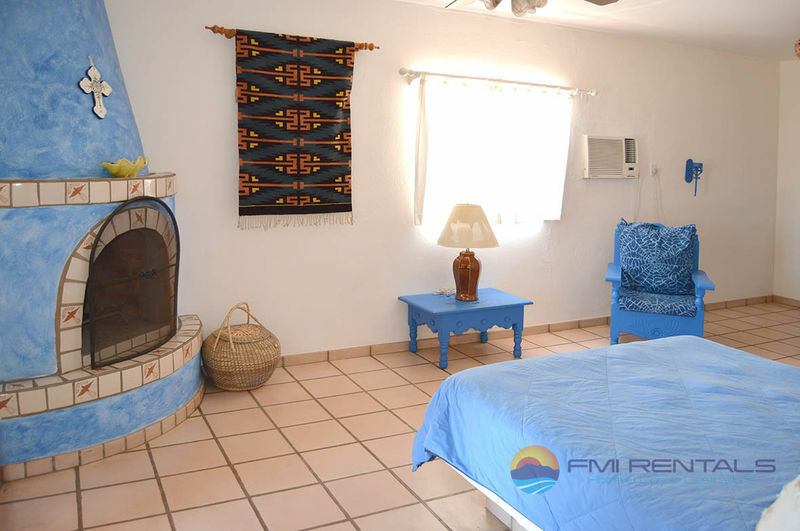 One bedroom has a queen bed, its own fireplace, a door to the deck, and classic Spanish décor. 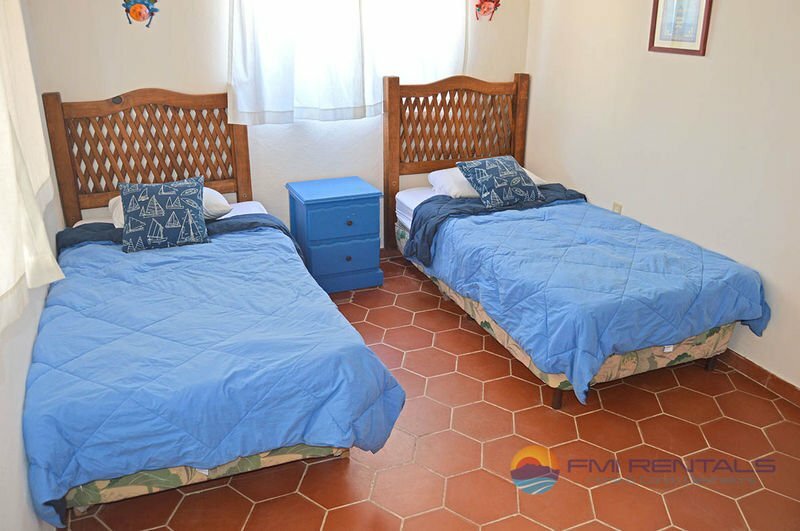 Another bedroom, perfect for kids, has two twin beds, separated by a cute blue nightstand. The final bedroom faces the deck, where one can wake up to a beautiful outdoor view; all great room choices to sleep. 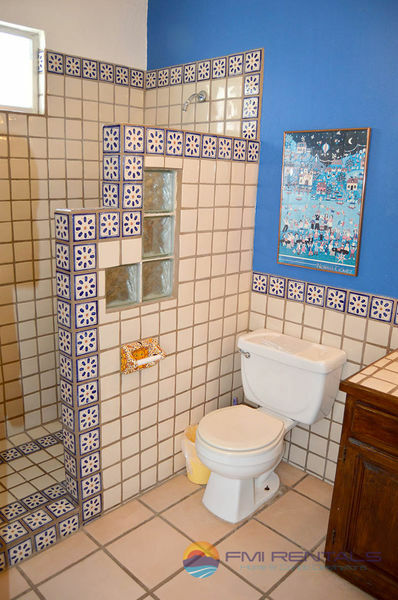 The décor of this house can be called adobe, or Spanish, with rich browns making up the floor tile and warm crème color walls, accented by blue furniture and accessories. It’s festive and fun, sure to help you keep up your energy. 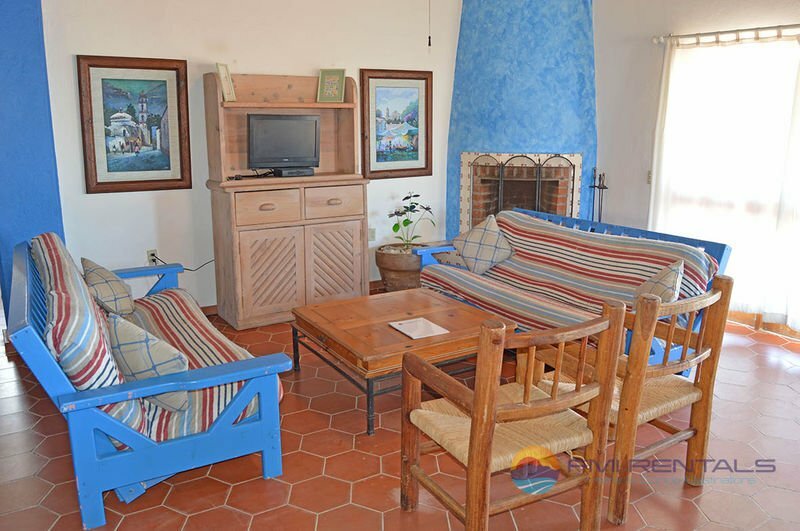 The living room has plenty of seating which surrounds a fireplace, two couches and a collection of wooden chairs. The large windows ensure, even if you are sleeping on the sofa bed, you’ll have a view of your own. 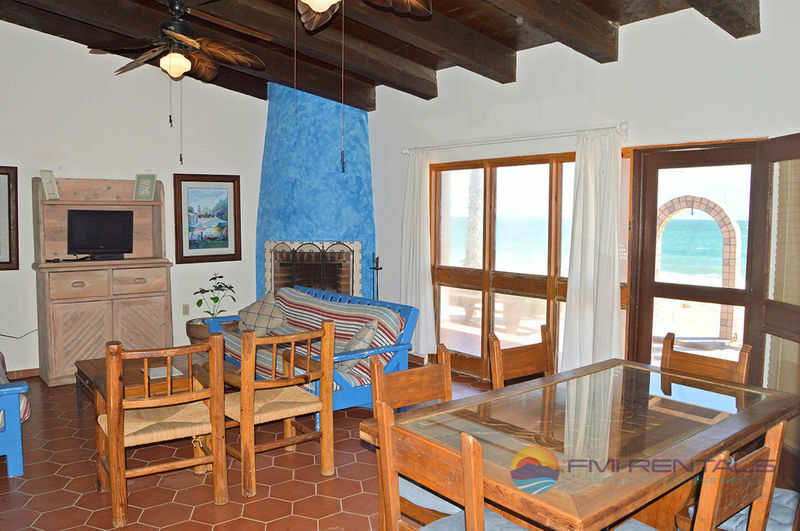 Beside the living room is a table to share dinner with friends and family, as is tradition in Mexico. A few feet away is the large kitchen with a countertop that wraps around like an “L”, allowing plenty of countertop talk with the chef. 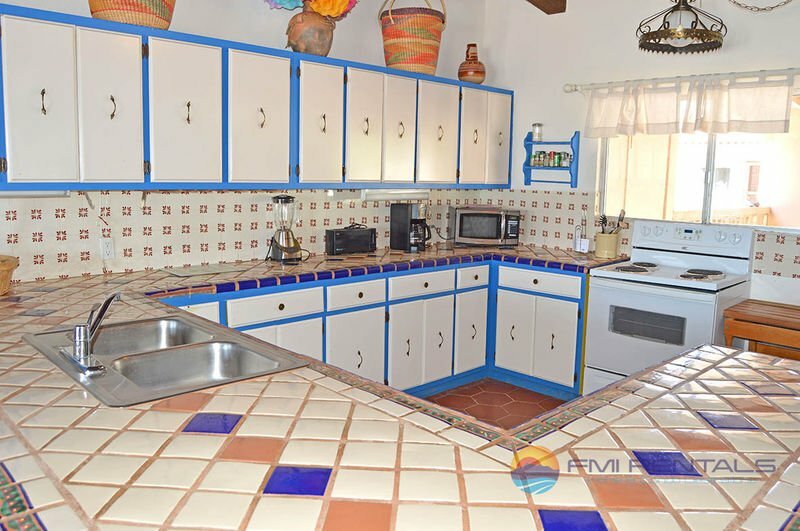 There’s plenty of space in the kitchen to prepare for the best of fiestas; the essentials are all in place: microwave, oven, large fridge. All you need is a group of people to enjoy the potential feast. All the basic amenities exist: heating, AC, linens and kitchen ware are proved, satellite TV; it’s even part of a gated community. 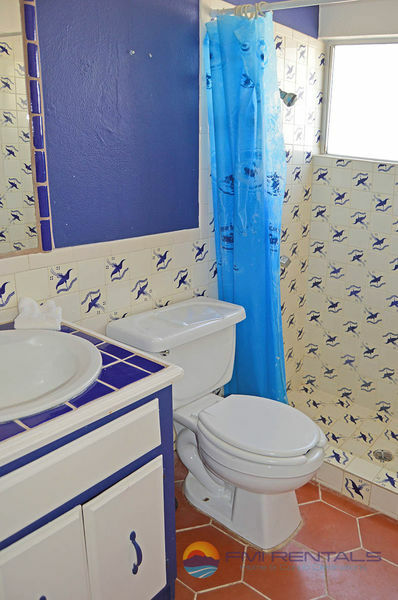 If you’re new to renting or not sure what to expect, this is the type of home you want. The essentials are provided and you have the peace of mind of a gated community. 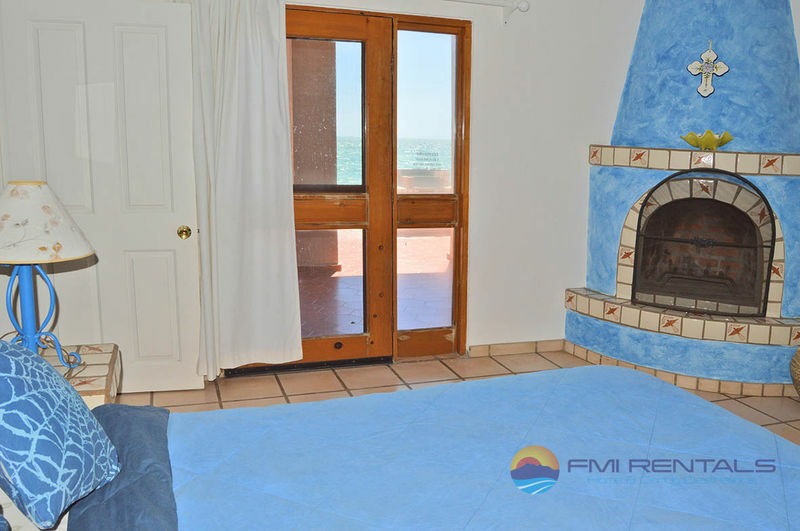 The reason for this rental is, of course, the beach; it’s right out front! 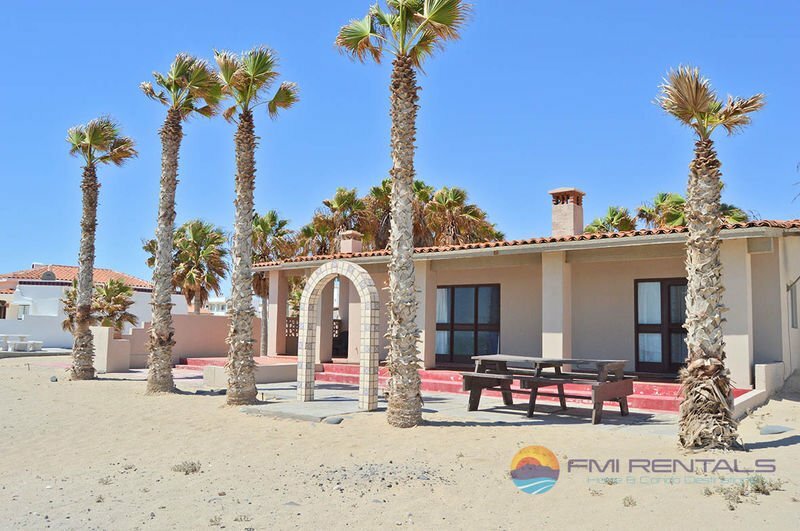 Five palm trees and a stone arch adorn the front of the house, as guardians as this beach paradise. 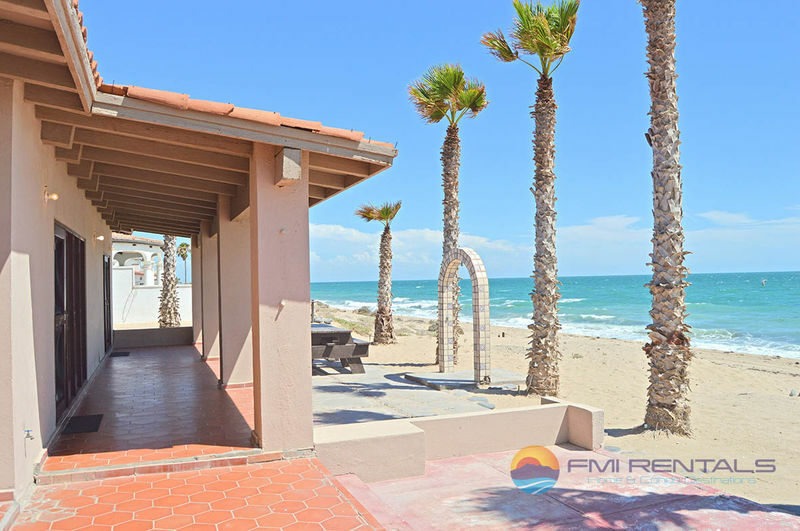 This place seriously packs a view, unique among Rocky Point rental homes; the beach is less 100ft from your front door. 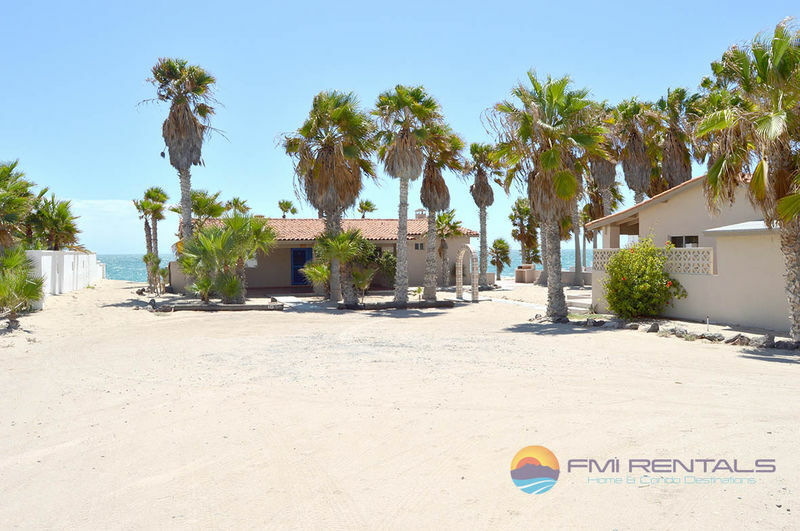 The beach waters are cool blue, splashing up onto the clean, golden sands that are the front yard of vacation home in Rocky Point. This is the style of vacation home that impresses everyone. 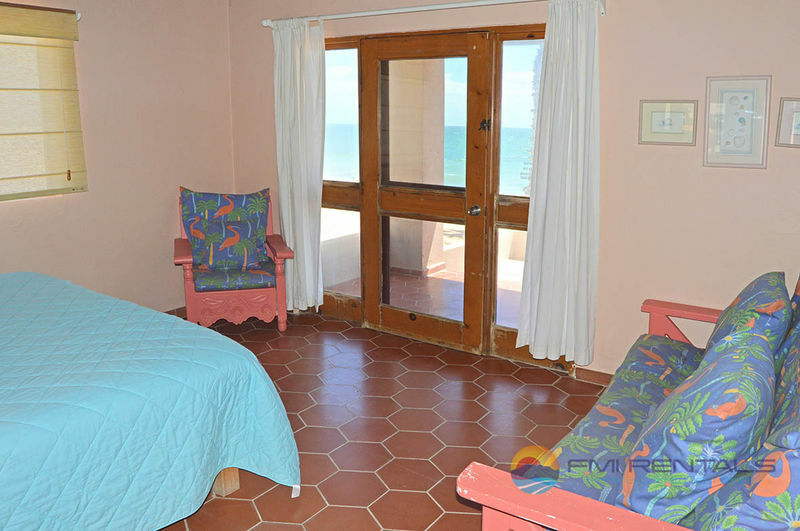 If you have a group looking for a Rocky Point adventure in a relaxing beach front house, this is your place.